Animal models play an important role in disease characterization, the identification of novel therapeutic targets, and the evaluation of therapeutic efficacy. Our laboratory employs a wide variety of behavioral assays in order to effectively model the neurobiology of substance use disorders, depression, anxiety disorders, or other highly related psychopathologies. Rodent behavioral testing also plays an important role in assessing key facets of these disorders such as compulsive drug seeking, anhedonia, or relapse propensity. In single-unit electrophysiology, microelectrodes are implanted into the brain in order to record the action potentials of single neurons. Action potentials are electrical signals that neurons use for cell-to-cell communication. These electrical signals can be captured by recording voltage at the tip of hair-thin microwires over time using an array or matrix of microwires. The expertise of the Barker Lab is to use organized microwire arrays that allow us to anatomically reconstruct the specific area of the brain where each microwire recording had occurred. 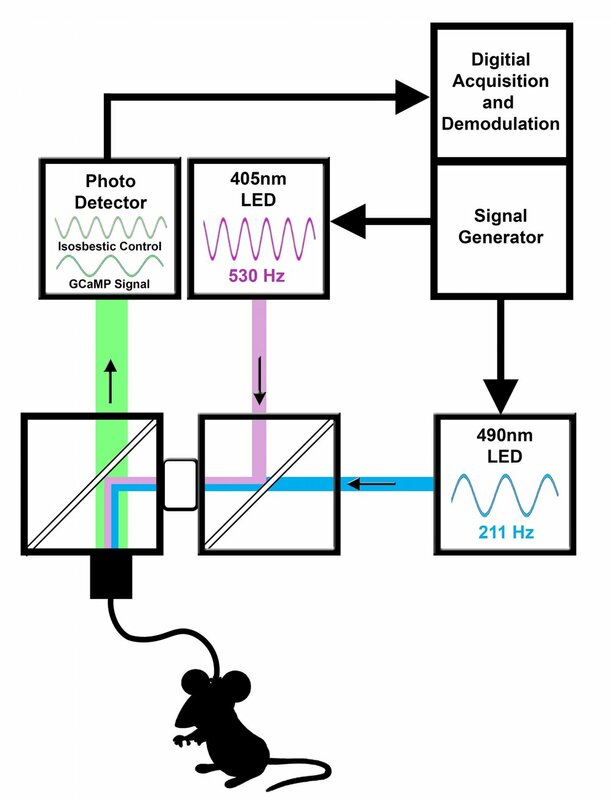 The lab combines this technique with fiber photometry to allow for simultaneous calcium imaging or with optogenetics in order to 'photo-tag' and identify the specific types of neurons that are being recorded. Fiber photometry is a technique for recording neuronal activity using an implanted fiber optic probe in conjunction with fluorescent sensors including voltage-sensitive dyes, synapto-pHluorin, CNiFERs, or genetically encoded calcium indicators such as GCaMP. Our work primarily involves the use of GCaMP and Cre-driver mouse lines in order to target specific populations of neurons and record their patterns of activity in response to reward, punishment, the self-administration of abused drugs, or in response to the presentation of learned cues that have been associated with the delivery of these stimuli. Understanding how neuronal ensembles process information is critical for determining their roles in both adaptive and maladaptive behaviors. Recent technological advances have provided the tools necessary for recording these cellular dynamics using miniature epifluorescent microscopes in conjunction with gradient refractive index (GRIN) lenses and green fluorescent calcium modulated proteins (GCaMPs). This technique allows for the simultaneous imaging of hundreds of genetically defined neurons simultaneously and can be used to record the activity of neuronal ensembles in deep within the rodent brain. Optogenetics is technique wherein light sensitive proteins called 'opsins' are genetically introduced into living brain cells or neurons in order to allow these cells to be activated or inhibited by the temporally specific delivery of bright light. The Barker Lab uses this technique in combination with special genetically engineered cre-driver mouse lines in order to target genetically defined populations of neurons and to modulate the activity of these neurons at their cell bodies or at their terminal projections. Investigating the organization of the nervous system is important for understanding the composition of neuronal circuitry and for differentiating the roles that individual brain regions play in guiding motivated behaviors. Our lab employs a mixture of novel and traditional anterograde and retrograde tract tracing techniques so that we might better understand neuronal connectivity. Anterograde tracing is a method for tracing from the cell bodies of neurons, along their normal path of communication, to their axon terminals in other parts of the brain. Alternatively, retrograde tracing involves the injection of a tracer within a terminal projection site in order to label cell bodies in other areas of the brain that provide inputs to the site of the injection. The brain is an incredibly diverse organ. To carry out its diverse functions the brains transcribes thousands of RNAs and translates these into equally numerous proteins. Labeling neuronal RNAs by in situ hybridization or neuronal proteins by immunohistochemistry provides one method for identifying and categorizing specific classes of neurons. These specific classes of neurons can then be genetically targeted and manipulated in order to ascertain their roles in specific adaptive or maladaptive behaviors. Microscopy has an important role in neuroscience research, allowing for the magnification and imaging of incredibly small cells, axons, or even synapses in the brain. To comprehensively study the specific component parts of neurons, a range of microscopes and techniques are necessary. Brightfield and Fluorescence microscopes are the workhorse microscopes of neuroscientists, and allow brain tissue to be magnified at ~2x-60x it's original size. Alternatively, confocal and electron microscopes allow for even greater spatial resolution and magnification through the use of more specialized technologies.